A benefit for Callen-Lacy Center for abused, neglected and abandoned children. WHO and WHY Callen-LaceyCenter for Children is the only emergencyshelter serving the youth of Berkeley County. Opened in 1998 in Moncks Corner,Callen-Lacey provides a secure,protective and nurturing environment for abused, abandoned and neglected children. Whenthese children are taken from their parents, we give them a home. The“Give Me Shelter” Campaign for Children is a unique year-long effort designedto raise funds in support of Callen-Lacey Center. Wehope you will support their work at this year’s annual Hope on Goat. 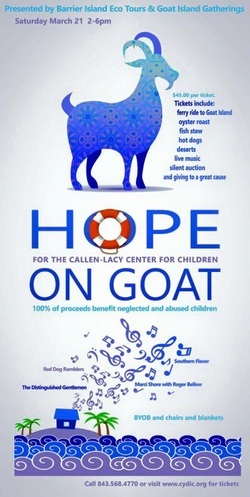 WHAT: Goat Island Gatherings and Barrier Island EcoTours will host the 6th Annual Hope on Goat fundraiser. This year’s fun filledevent will support efforts of Callen-Lacey Center for Children’s shelter tohelp provide a safe, nurturing environment to youth in Berkeley County who havebeen abused, abandoned or neglected. Attendees will enjoy local oysters over ahot open fire, delicious local fish stew, live music, a silent auction and achildren’s station with games and activities. Barrier Island Ecotours willprovide a boat ride to and from Goat Island Gatherings, a charming venue on asea island surrounded by palm trees and salt marsh. WHEN: Saturday, March 21, 2015 from 2-6 p.m. Rainor shine, beach chairs and coolers welcome. No pets please. Guests will meet at the Isle of Palms Marina located at 50 41st Avenue, Isle of Palms, SC 29451. Barrier Island Eco Tours willprovide boat shuttles to and from Goat Island throughout the entire event. Tickets are $45 each.Children 10 and under are free. All proceeds from ticket sales and silentauction will go directly to Callen-Lacey. To purchase tickets please visit thefollowing link https://cydc.org/hope-on-goat/.